It is over two months since I wrote about the Hilton annual Winter Sale, which offers decent discounts across Europe, the Middle East and Africa. It is worth another mention as you only have two days left to book. Whilst it is nominally called the Winter Sale, you can book for any weekend until the end of 2016. The sale offers a discount of up to 35% off the standard Best Available Rate if you are a Hilton HHonors member, albeit that sale rates require prepayment and are non-refundable. The discount is reduced to a maximum 30% if you are not a Hilton HHonors members, so you should sign up for free if you have not already joined. Hilton has a special website for the sale which can be found here. 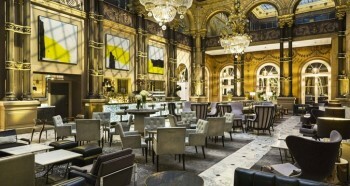 The picture above is the new Hilton Paris which would probably welcome your custom this year. I’ve got a fully refundable booking for the Hilton Gatwick in July, can I cancel and immediately rebook as it’s cheaper in the sale? Think youve just answered your own question. The only thing to add is make sure they still have availability for the date yuou want. 19.19% for free members, but still incredible! Unfortunately no, as only valid for up to 30th December 2016! That’ll be the reason then…. I managed to get a Hilton Diamond match (first time I’ve had it – thanks HfP). I’m staying at the Conrad St James in Feb (booked one of the above Winter Sale rates). What is the etiquette for getting a room upgrade? Do you have to actually request it at check-in or is it done automatically (if there’s availability)? Check in on the app the day before. Have used Barclaycard voucher for free night and got Diamond match (via Amex plat/accor) and got upgraded to junior suite. You can also select room/floor. Hope to do same in Conrad Tokyo on wife’s voucher. All thanks to HfP! I was matched to diamond days before staying at the WA in Edinburgh emailed and asked for an upgrade had a nice junior suite as was able to check in at 10am and checked out at 2pm with free breakfast. And that was booked via BA holidays sale! Hilton Status matched me to Gold prior to Xmas . I reapplied deadline day and got Diamond. Last weekend had 3 rooms in London Wardorf all upgraded to Executive rooms and lounge access. Saved a small fortune on pre dinner drinks and feeding hungry kids afternoon teas and snacks, not to mention the free breakfasts. Just forgot to book Groucho Restaurant via Amex Platinum for free champagne on arrival. I mentioned the status match to 3 US mates who although missing the deadline privately messaged Hilton with a request for a match which was honoured last week. So maybe worth trying if you missed the deadline and have status elsewhere. Just missed another opportunity for a June booking. They come along on a fairly regular basis, I think you are safe that something will appear before June.